Within the exotic world of macroscopic quantum effects, where fluids flow uphill, wires conduct without electrical resistance and magnets levitate, there is an even stranger family of "unconventional" phenomena. These effects often defy explanation by current theoretical physics, but hold enormous promise for the development of such futuristic technologies as room-temperature superconductors, ultrasensitive microscopes and quantum computation. Last week's announcement by a Stanford team in Physical Review Letters that it has created the world's first dipolar quantum fermionic gas from the metal dysprosium – "an entirely new form of quantum matter," as Stanford applied physics Professor and lead author Benjamin Lev put it – represents a major step toward understanding the behavior of these systems of particles. And this understanding makes for a leap toward the supernatural-seeming applications that condensed-matter physics promises. When the thermal energy of some substances drops below a certain critical point, it is often no longer possible to consider its component particles separately. Instead, the material becomes "strongly correlated" and its quantum effects become difficult to understand and study.Making the material out of a gas of atoms allows what is normally only observed on a nanometer scale to become visible. These quantum gases, the coldest objects known to man, are where researchers see zero-viscosity fluids – superfluids – that are mathematical cousins of superconductors. The invention of the key technique for cooling gases to near absolute zero netted Stanford Professor Emeritus Steven Chu a Nobel Prize in 1997. While researchers have been cooling gases into the quantum realm for two decades, creating strongly correlated quantum gases has proven a much larger challenge. The basic cooling method hasn't changed significantly since Chu's days, but the techniques employed have become more extreme. Lev and colleagues heated their particles in a crucible to around 1,300 degrees Celsius and shot them into a powerful vacuum. Using the world's most powerful continuous-wave blue laser, the particles were then cooled to within a thousandth of a degree of absolute zero. Subsequent lasers and an evaporative cooling process eventually brought the gas down to the experimental temperature of 64 nanokelvin – very, very cold. Until now, research efforts had focused on cooling bosons – fundamentally different from fermions, and much easier to work with – and weakly magnetic fermions. The Stanford team extended these techniques to gases made of the most magnetic atom: a fermionic isotope of dysprosium with magnetic energies 440 times larger than previously cooled gases.The leap presented two major challenges. 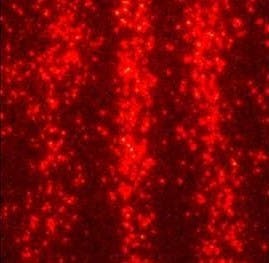 The initial step – trapping particles in the "optical molasses" created by the high-powered lasers – works by exciting a particle and then allowing it to return to its initial state. The particle loses energy in this process, cooling dramatically. Typically, the substances that researchers cool in this way only have two or three energy levels, making for a simple "optical loop." Dysprosium, on the other hand has more than 140. "Everyone thought it was impossible for this most complex of elements," said Lev.Although this detail made for a daunting technological challenge, the second difficulty was thought to be even more fundamental. The evaporative cooling process the researchers hoped to use to bring the gas down to the nanokelvin range depends on collisions between particles. Collisions both dissipate energy and knock high-energy particles out of the system. "But the lore in the field is that identical fermions never collide," Lev said.Fermions obey the Pauli exclusion principle, which states that no two fermions can occupy the same state simultaneously. This inviolable rule seems to disallow direct interactions between fermionic particles. Dysprosium's status as the most magnetic element was crucial to overcoming this apparent impossibility. Because of the extraordinarily strong magnetic dipolar interactions between the dysprosium atoms, the particles were able to cool to below the critical temperature by colliding from afar, despite being quantum mechanically identical. Thus far, the result of the Lev lab's high-tech efforts is a tiny ball of ultracold quantum dipolar fluid. But the researchers have reason to believe that the humble substance will exhibit the seemingly contradictory characteristics of both crystals and superfluids. This combination could lead to quantum liquid crystals, or quantum-mechanical versions of the liquid crystals that make up most electronic displays. Or it could yield a supersolid – a hypothetical state of matter that would, in theory at least, be a solid with superfluid characteristics. The researchers have already begun developing a microscope to make use of the dipolar quantum fluid's unique characteristics. Their "cryogenic atom chip microscope" is a magnetic probe that should measure magnetic fields with unprecedented sensitivity and resolution. This kind of probe may even allow for a more stable form of quantum computation that uses exotic quantum matter to process information, known as a topologically protected quantum computer.Beyond these applications, the study offers physicists another line of attack toward understanding unconventional quantum effects. "It's a problem that has stood unresolved since the mid-80s," said Lev. "It's worth taking a new approach."